The observed dc magnetic susceptibility of ferromagnetic vanadate pyrochlore Y2V2O7 is simulated using a D3d crystal-field and mean-field approach and taking into the effect of spin-orbit coupling and anisotropic covalency overlap. The g-tensors and the exchange interactions among V4+-ions are found to be anisotropic. The 2D term of 3d1 V4+-ion is split into 5 doublets with overall splitting Δ1 ≈ 2 eV and the total splitting of the 2T2gstate Δ0 ≈ 0.4 eV under combined action of octahedral crystal-field, trigonal distortion at V-site and spin-orbit coupling. 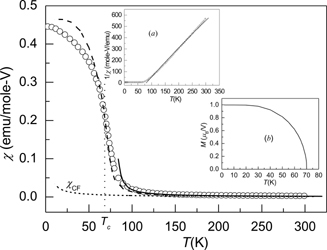 The V4+ ion has a substantial easy-axis single-ion anisotropy along local <111> axis of a given V4 tetrahedron, particularly below Tm = 170 ± 10 K. The temperature Tm may be associated with the initiation of ferromagnetic clusters embedded in the paramagnetic matrix that gradually develop a temperature dependent spin-like gap of the lowest Kramers doublet of Y2V2O7, as also found for Lu2V2O7.